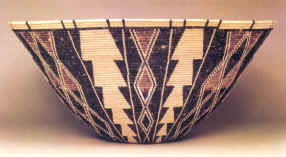 Isabel Hanson uses the geology of the Northern Panamint Valley as inspiration for the designs on her baskets. Isabel, who's father was Indian George, was born in 1880. Isabel was born in Warm Springs, in the Panamint Valley, and moved to Darwin in 1947. 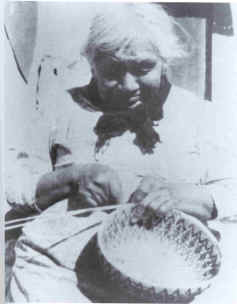 She made large baskets in her early years and sold them in Trona. 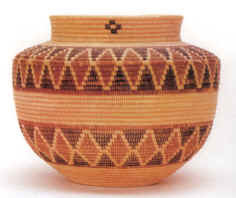 In her later years, she raised goats and made smaller baskets with geometric designs and sold them at Panamint Springs to tourists. She died June 3, 1964.